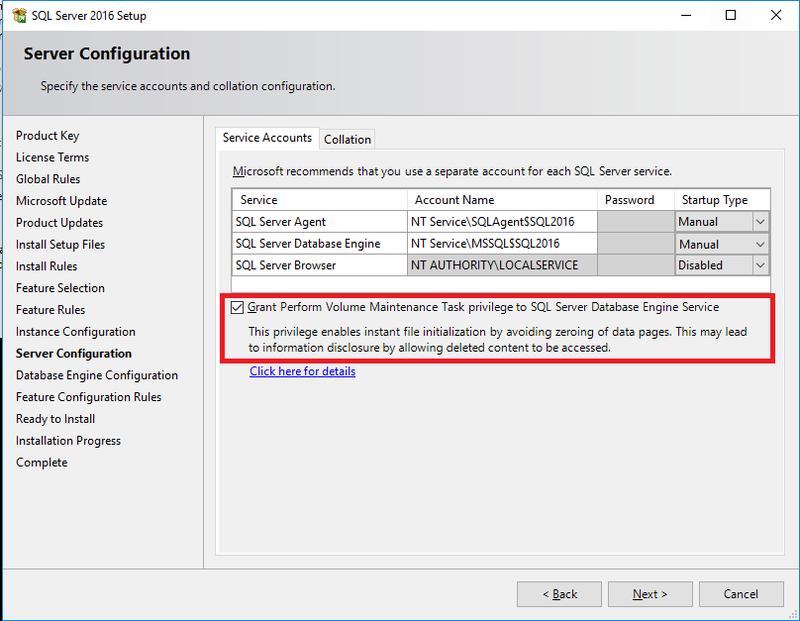 In case you don’t know what this is, it is a setting that can be granted to the service account that the SQL database engine runs under that prevents SQL Server from “zeroing out” new space when a data file is created or expanded. This improves the performance of CREATE/ALTER DATABASE statements, RESTORE statements and AUTOGROWTH operations. A full detailed article to how and why can be found here. I can’t think of any downside to having this enabled (off the top of my head, there’s probably one or two) and it’s good to see that Microsoft know that most people enable it so adding it as an option in the installer is great imho. This entry was posted in Install, Internals, Maintenance, SQL 2016. Bookmark the permalink. The only downside that I’ve heard of is that it opens a very tiny security hole. This is because it allocates the space for the new database file without overwriting the old data that was stored on those same blocks on disk. If someone was somehow able to get their hands on a decrypted copy of the data file (when not using TDE) then they could potentially crack it open with a hex editor and see the data inside.